An Australian shipyard has launched the first two of four inshore patrol boats ordered by the Armed Forces of Malta. Austal is due to deliver the four 21-metre boats to the AFM late next month. They will replace two Swift-class boats and a Bremse-class patrol boat which are to be withdrawn from the Maltese fleet. The Swifts had been donated to Malta second-hand by the American government in 1971 while the former East German Bremse patrol boat was bought from Germany after German reunification. Another Bremse boat is to be retained by the AFM after its engine was changed. 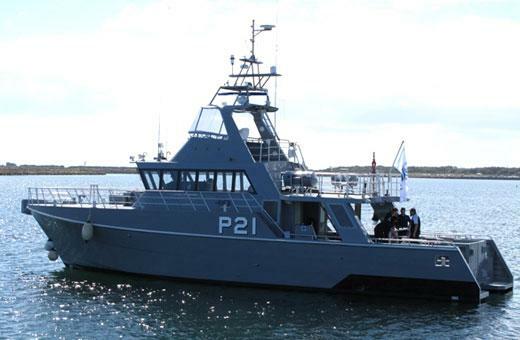 The new €9.3m Austal boats, partly financed by the EU, are being built to Maltese specifications and will be tasked with patroling the harbours and coastal waters. They will be equipped with machine guns, fire-fighting and rescue equipment. The new boats have a stern ramp for the launching and retrieval of a rigid hull inflatable boat, as is the case with the offshore boats in the AFM fleet, the American-built Protector class P-51 and P-52 and the bigger Italian modified Diciotti class P-61. Sea trials of the new Austal patrol boats will start in the coming days, as will the training of the crews. The four boats will be shipped to Malta on a cargo ship after hand-over to the AFM.